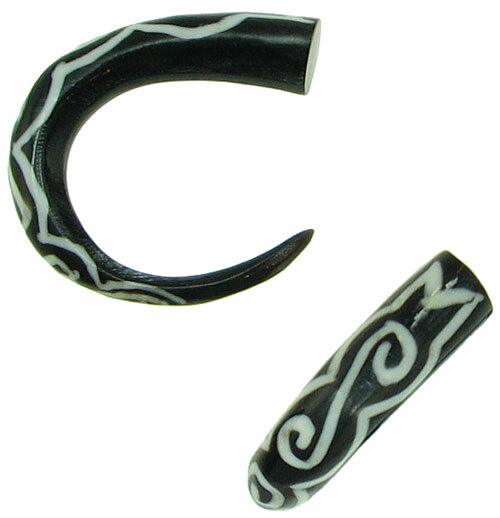 Dark Horn Tapered Claw Earrings with White Tattoo Designs are light weight, comfortable, unique and eye-catching. These water buffalo horn earrings are hand carved, rather than mass-manufactured, so some variation (such as color, texture, size, etc.) is present from piece to piece in a pair and also from the pair shown in this photo. Available in 7 gauge, 6 gauge and 5 gauge sizes. Our Natural Body Jewelry is 100% handmade from sustainable and renewable resources and fairly traded with small businesses.